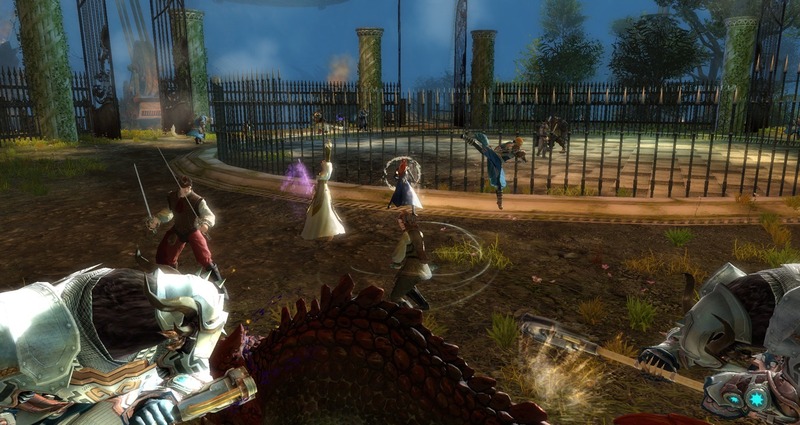 Emissaries from across Tyria were here, including Rox who attended the jubilee on Rytlock’s behalf. It’s understandable why he wouldn’t want to come, and this give’s him a chance to put Rox to the test. I was a bit surprised to see that Braham had decided to accompany Rox. He’s not here on any official business, but due to his recent breakup with Otilla, nothing is tying him down to Cragstead. Lord Farren attended the ceremony as well, and I overheard him mention that the Ministry Guard were not stationed here. To an outsider it might seem strange that the ministers of Divinity’s Reach do not have a stronger presence here. However most locals would understand that Minister Caudecus and the Ministry Guards are rumored to be working against Queen Jennah. New mechanical guards called Watchknights were introduced at the opening ceremony. 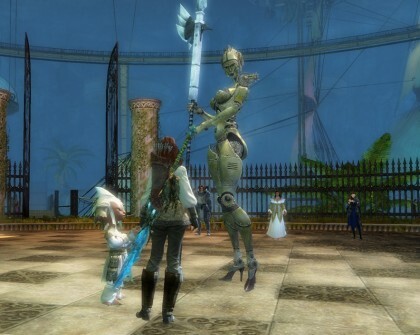 Unlike the asuran golems, these Watchknights are shapely and seem to be a human innovation. No one told me who or what organization was responsible for building these. As a demonstration of the Watchknight’s powers, Logan Thackeray volunteered to test it’s might in combat. Countess Anise cast an illusion over it to change it’s appearance. The battle started out simple enough and the Watchknight’s appearance shifted to different foes, leading up to a final battle between Logan and “Rytlock”. 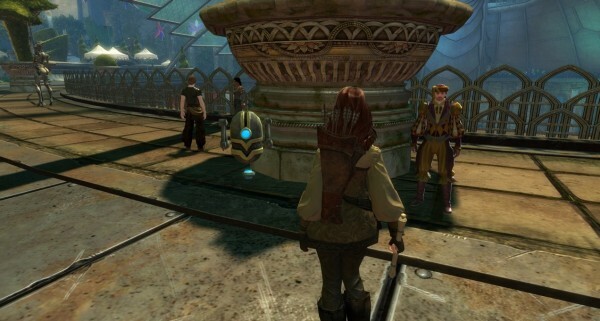 The encounter shook Logan and he demanded that Anise shut the Watchknight down at once. 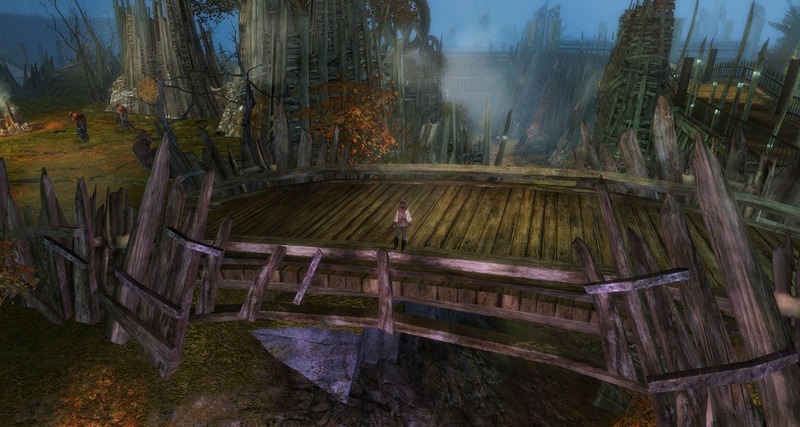 Something was tampering with her commands and no one could get the arena gates down. Suddenly an Aetherblade ship appeared and it’s pirates attacked everyone. We had to kill them and then search for whoever was sabotaging the celebration. 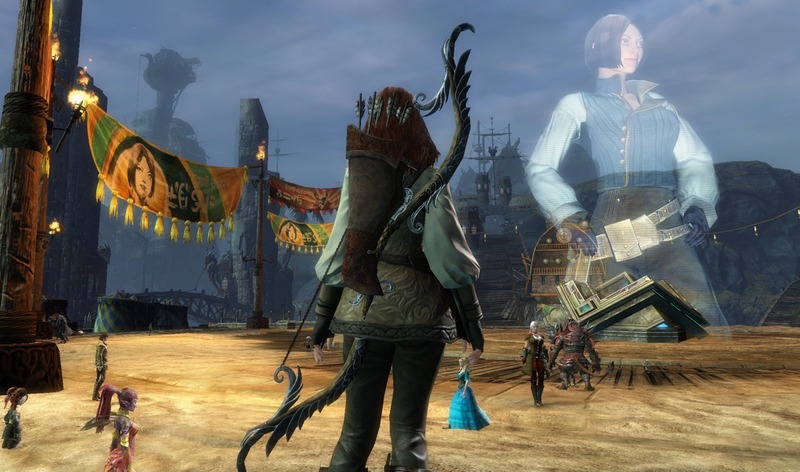 Rox spotted a mysterious figure in the distance, which she tried and eventually succeeded in shooting with her bow. With the strange intruder taken care of, arena gates were drawn down and we killed the Watchknight disguised as Rytlock. 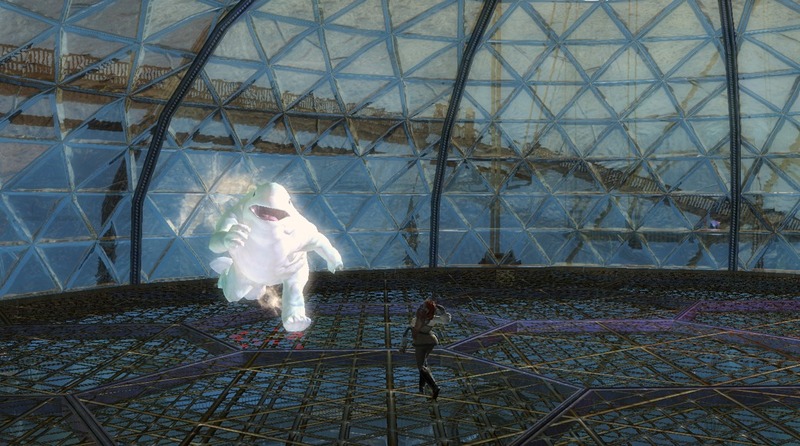 Immediately after this, the mysterious figure appeared briefly at the center of the arena. She was a hooded sylvari, dressed in red leather. She said “Aw, you spoiled my fun. Now I’m going to have to make a special project out of you“…and then she vanished. 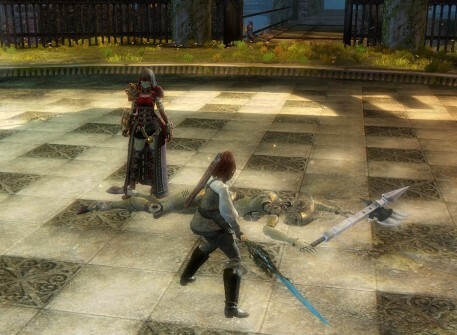 It’s unclear why the Aetherblades targeted the Queen’s Jubilee. After their failed attempt at stealing a seat on the Captain’s Council, they have attacked people at Zephyr Sanctum and now the Queen’s Jubilee. Do they want to take power from established organizations and cities, or just cause chaos? 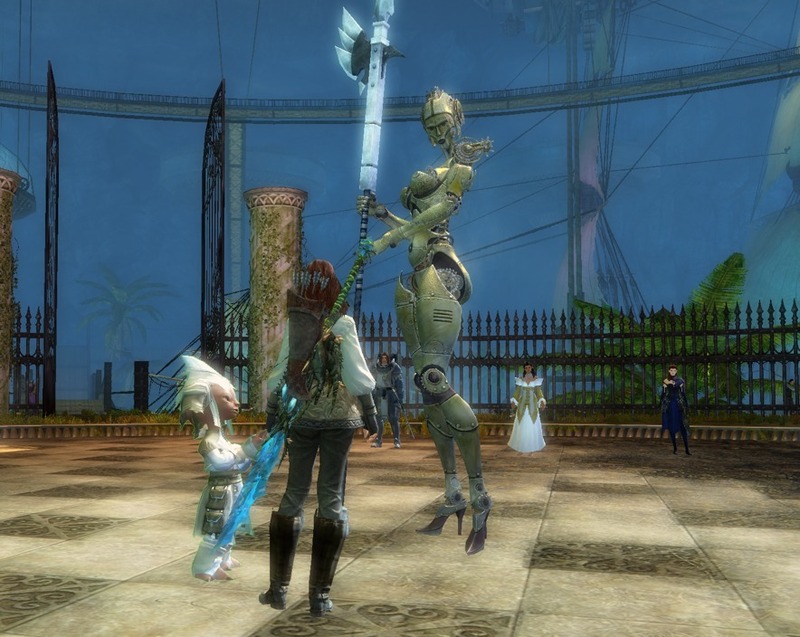 The Aetherblades were interested in the holographic technology during the Dragon Bash. Which made me stop and consider that they wanted to harness the Zephyrite aspects and steal plans for the Watchknights. With their ties to the Inquest, these technologies could be used in their favor for evil purposes. With the Crown Pavilion safe (for now), I stopped to look at the arenas. 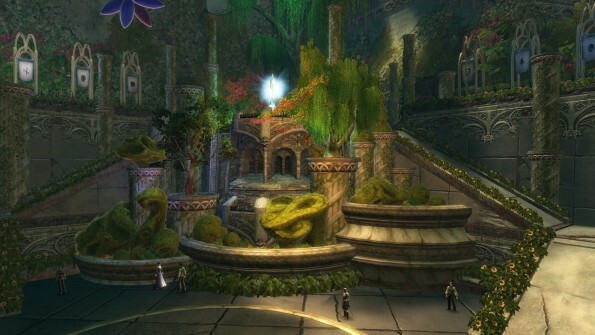 On the lower levels at the center, there are emissaries for the six other cities: Black Citadel, Hoelbrak, Rata Sum, the Grove, Lion’s Arch, and Ebonhawk. Each of them offer to enhance your abilities in exchange for representing them in the six different arenas. These arenas are filled with foes (Watchknights masked by illusions) that humanity has fought in the past. Listing them in the order they appear clock-wise: Flame Legion, bandits, ogres, Destroyers, pirates, and centaurs. Emissaries also sell attractive new Sovereign weapons made out of a yellowish stone material and often featuring the visage of a beautiful woman. 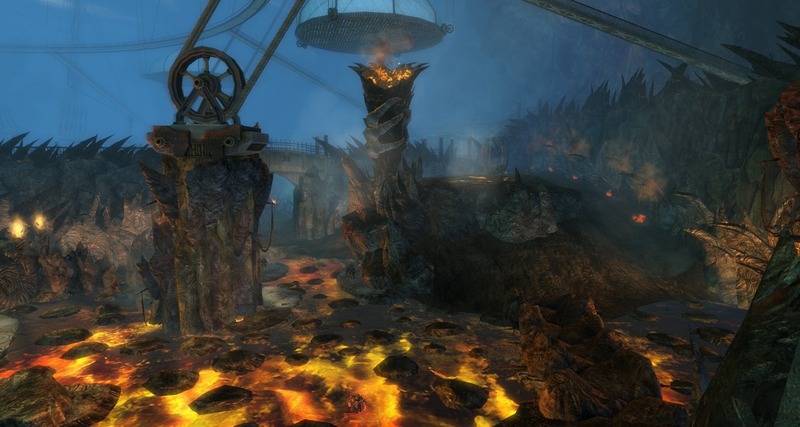 Starting with the first arena: the Flame Legion were responsible for the Searing of Ascalon and the attempted invasions of Kryta and Orr. Humanity has never truly defeated them; only endured and moved on. Sparcus Firesplash appears in this arena as a champion of the Flame Legion. He channels a cauldron that sends small crystal shards raining down into the other sections. Bandits are another enemy humans have fought for ages. They’re ruthless, amoral, and seek to disrupt society and it’s leaders. In recent events, bandits have been responsible for attempting to overthrow Queen Jennah. Rumors also suggest that a certain minister has paid off bandits to do this. Boom-Boom Baines is the bandit’s champion, and while she is alive, her bandits sneak into each area and place bombs. Ogres are not native to Kryta, and it’s strange that they are included here. They are an intelligent race found in Ascalon that collect and tame exotic animals. Some tribes are even friendly to other races and will work to drive away Kralkatorrik’s minions. In a broader sense, ettins which are similar to ogres are native to Kryta and have been a nuisance for over 250 years. They are not present in the pavilion though. Shurakk the Savage is the ogre’s champion, and while he is alive, hawks are sent across the arenas to peck at adventures. Destroyers have been a threat since 1078 AE when earthquakes shook Tyria and asura were driven out from their underground homes. 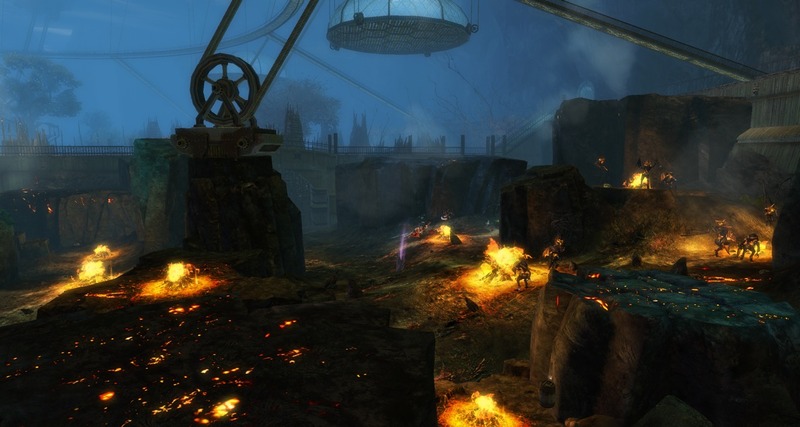 They quickly spread across the depths of Tyria and became a threat to all races. Heroes were able to defeat The Great Destroyer, but that was just a champion of the dragon Primordus. In Queen Jennah’s arena, we fight Pyroxis which is a different champion of the Destroyers. While it is alive, adventurer’s endurance is drained from insufferable heat. Pirates are a recent threat to Kryta, but they are also responsible for helping build and run Lion’s Arch. This section of the arena is devoted to the pirates that remain a threat and continue to plague Gendarran Fields, the Bloodtide Coast, and all ships which travel the Sea of Sorrows. Wiggin the Wicked is the pirate champion, and while he is alive, artillery barrages rain down across the arenas. Centaurs were not native to Kryta during my heroic ancestor’s time. 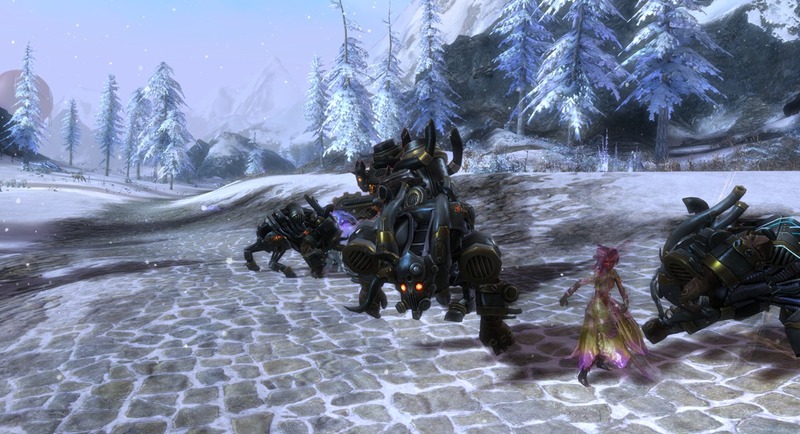 They were spread across the Shiverpeaks, Maguuma Jungle and the Crystal Desert. The first two areas are completely devoid of centaur tribes today. In Kryta, centaurs are a major threat and they push our weakened race to it’s limits at times. 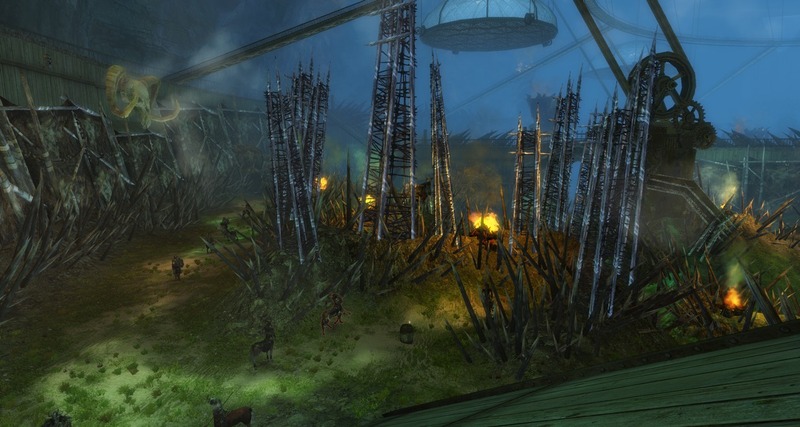 Their populations have surged, and their tribes can be found in all Krytan areas except the Bloodtide Coast. Rumors persist about a certain minister getting the centaurs to attack, just to put Queen Jennah in disfavor. Kuraii the Cruel is the centaur champion, and while he is alive nature spirits will give other enemies in the arena some boons. Above the six zones is the Queen’s Gauntlet. 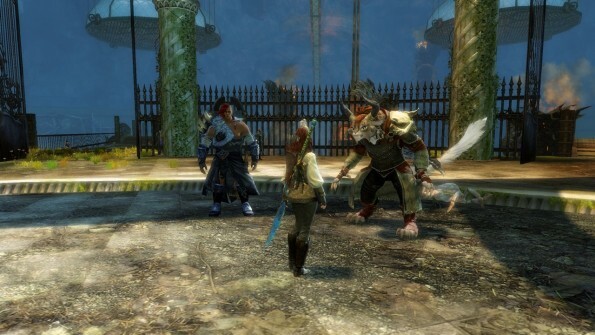 Adventurers enter a special arena where they fight alone against another opponent (or sometimes multiple opponents). It’s designed as the ultimate challenge, only those that pass all three tiers and defeat Liadri the Concealing Darkness earn the greatest glory. Admittance to the gauntlet is paid by special tickets which can be found by defeating foes in the arenas below or purchased with money and watchwork sprockets (currency acquired by defeating Watchknights). Each of the opponents in the Queen’s Gauntlet have strengths or abilities you must overcome. I’ve only just begun to try the gauntlet, but the higher tiers seem to really test your skills, stamina, and perhaps most crucially, your patience! Putting those aside, I took a look at the other highlights of Queen Jennah’s jubilee. For a steep price, anyone can have access to a handy new hub in the Royal Terrace. 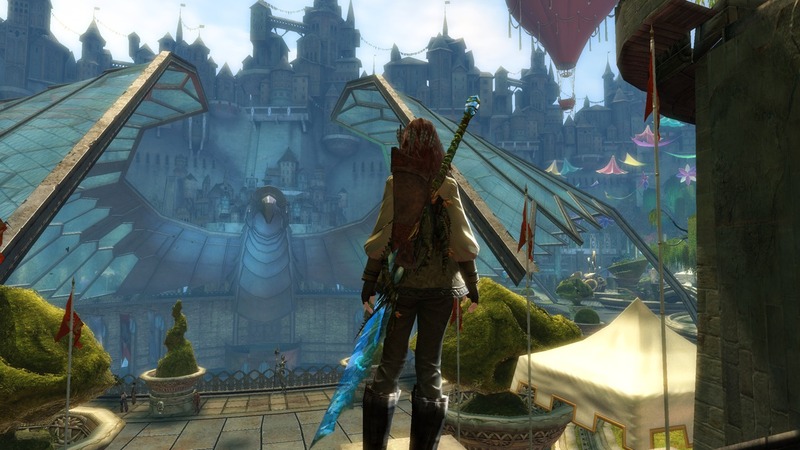 Merchants, Black Lion Traders, crafting stations, armor repair specialists, and even an asura gate leading to all the main cities are packed here. By the Crown Pavilion, merchants and beggars have gathered to relieve party-goers of their coins. A Consortium golem named Job-o-Tron from Southsun Cove changed it’s name to Hobo-Tron, and is now begging for money. 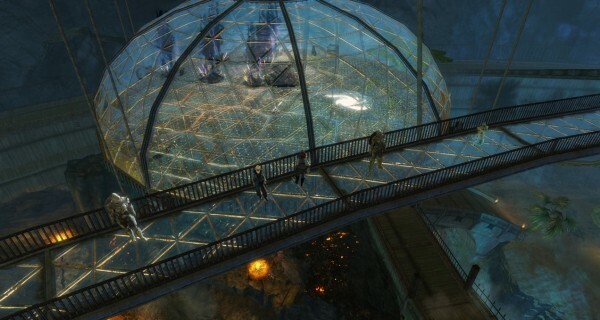 I don’t understand why a golem needs money, or why the Consortium would fire it. Marcello DiGiacomo stands beside the golem, vying for attention. He appears to be a minstrel or some other performer, but I’ve yet to hear him sing or dance. Outside the Crown Pavilion, adventurers can participate in lighting beacons around Divinity’s Reach. They are a symbol of humanity’s hope, and serve to inspire humans and show our pride to other races. As a bonus, an endless torch is the reward for completing all four races. 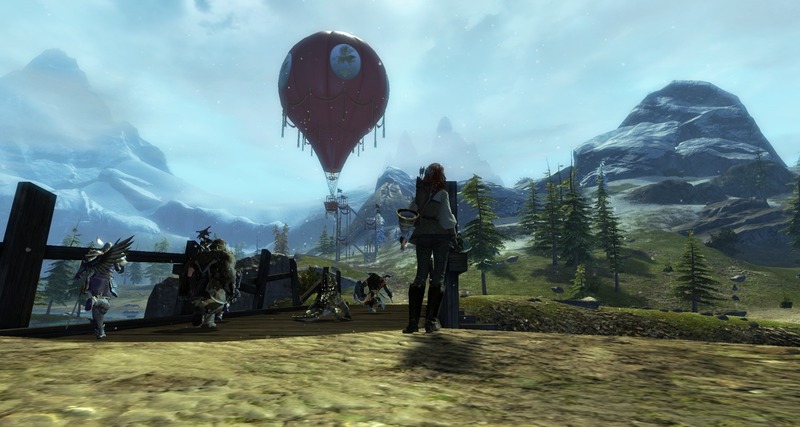 Across Tyria, Queen Jennah has sent hot air balloons to give emissaries and adventurers a free ride to her jubilee. Aside from the dangers that plague Tyria’s lands, the Aetherblade pirates and steam creatures have used this opportunity to target the queen’s guests. 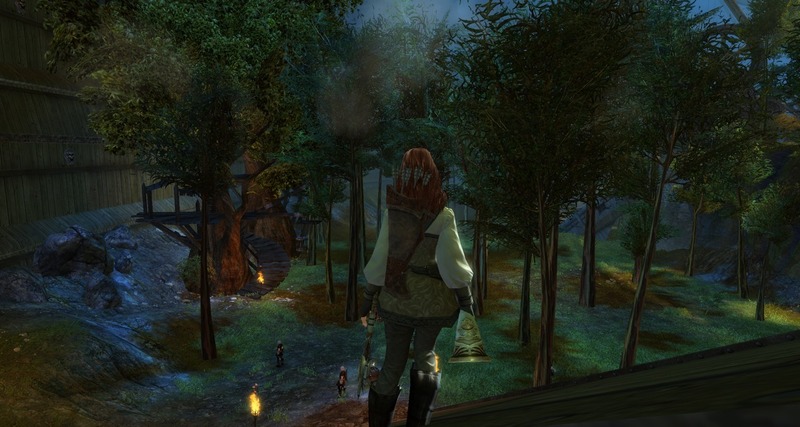 Along with my friend Grekel Feraldrum, we visited Ascalon, the Shiverpeaks, Kryta and the Maguuma Jungle to help emissaries, and stop the Aetherblade pirates. For sport, Queen Jennah has also commissioned highly trained Seraph champions to challenge willing adventurer’s mettle near these balloons. 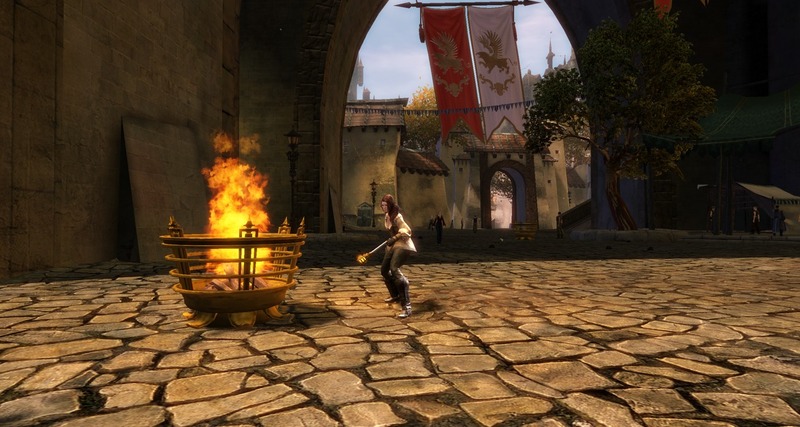 After participating in all of the jubilee’s activities, I returned to Lion’s Arch. Ellen Kiel had won the election and secured the trade contract with the Zephyr Sanctum just days ago. Already a colossal hologram has been designed and now projects from the spot where the famous lion statue is usually found. It’s still early but I’ve yet to see the benefit of the trade agreement in Lion’s Arch. 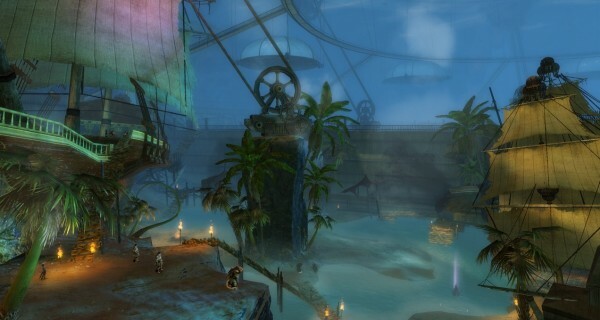 Hopefully some of it’s merchants and wares will make their way here soon. Below the hologram, Ellen Kiel stands proud and thanked everyone that had voted for her. I expected to see her at the jubilee, but it’s understandable that Kiel has new obligations to fulfill on the Captain’s Council now.